The latest technology, a mobile app and connectivity with various machines and devices allows you to enter and read data directly in the field. Data are stored in the cloud so you have access anytime, anywhere, always in sync with your accountant and farm consultant. 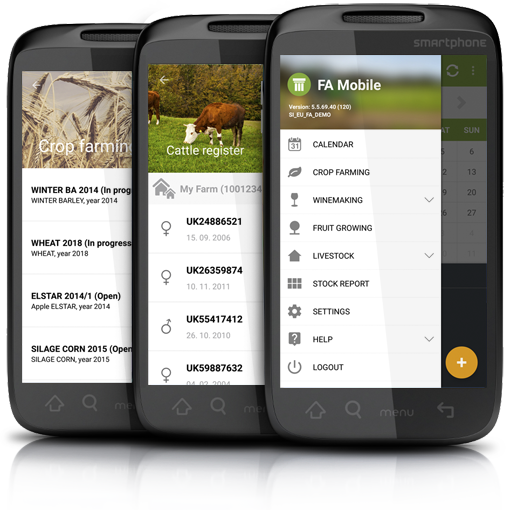 PANTHEON Farming Mobile is the mobile version of the farm management information system. Animal and crop data can be viewed and entered directly on location. Data are automatically synchronized with the main PANTHEON Farming database in the cloud. The database can be accessed remotely by the user and the accountant to prepare financial and FADN reports. Using the mobile app is easiest in combination with PANTHEON Hosting.The PANTHEON Farming Mobile application is included in the lease price of every PANTHEON Farming solution. The PANTHEON Farming mobile application is free for our users.